Rising Sea Levels and Sinking Buildings: What Gives? According to a recent article in Australian Popular Science, a study of satellite imagery in the aftermath of the first Nepal earthquake has found that part of the Himalayan Mountain range has dropped about 1.5 metres whilst the area around Kathmandu has risen by the same amount. It is believed that these movements are the result of tectonic rebound, where the release of energy associated with the earthquake allows the meshing plates to slip and rebound. The article suggests that as the process continues, the Himalayas and Kathmandu will settle back into place. But what is the right place for them to settle? Building designers, particularly structural engineers, go to great effort to design buildings that move as little as possible, if at all. We look for solid founding on mother earth and design our buildings and infrastructure to rest ‘on solid ground.’ We assume that, adequately tied to solid ground, our built form will be safe and functional for its entire design life, usually considered to be 50 years, and possibly beyond. But increasingly, building designers need to consider the implications of changes to things that we thought would never change. I have personally seen the need for this in two projects I am currently involved with. This need was brought to light not as a result of earthquake induced ground movement, but because of rising sea levels. A low-rise retail development located in Footscray is currently being designed. As with many developments in this area, the design has to deal with subsurface conditions associated with Coode Island silt, a highly compressible material with anticipated settlements of five millimetres per year indefinitely into the future. Being low-rise and with intensive services reticulation, a stiffened floating raft slab was initially considered rather than a conventional piled solution, primarily to minimise the risks associated with differential settlement of services and pavements transitioning from the hard piled platform to the surrounding settling ground. Being in a flood prone area, the town planning permit required the floor level to be set to satisfy Melbourne Water requirements. In the Melbourne Water document Planning for Sea Level Rise – Guidelines, dated 5 June 2012, the current (at the time) 100-year flood level associated with Port Philip Bay is set at Australian Height Datum (AHD) 1.6 metres. However, to deal with predicted sea level rise, the applicable 2040 100-year flood level is set at AHD 1.8 metres and the level predicted for 2100 is AHD 2.4 metres. 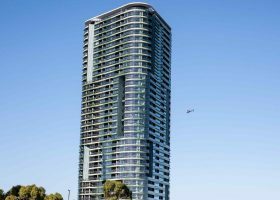 Melbourne Water instructed the design team to provide finished floor levels at a minimum of 2.4 metres to AHD. To satisfy this requirement for a design life of 50 years on this site meant at least an additional 250 millimetres of height needed to be added to the floor level so that after 50 years of settlement, the floor remained above AHD 2.4 metres. 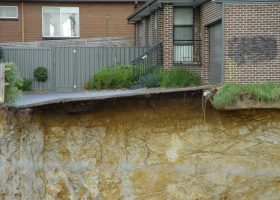 The economic implications of raising all building and pavement levels to satisfy this requirement tipped the optimum foundation design solution back to piles. The second project involved extending an aged care development that is situated in an overland flow path for 100-year floods. Once again the issue became ‘which 100-year flood?’ 2040 or 2100? The extent and height of the flood plain has significant impact on the siting of the proposed development and the level at which the floor level is set. Sounds simple, but the implications can have significant impact on the extent of flood prone land that can be built on. If additional hydrological studies are required to establish new flood plains in particular areas for particular developments, this can have time and cost implications for a project. Perhaps the most famous international example of rising sea-levels and sinking buildings is Venice, Italy. Venice’s subsidence was recognized as a major issue decades ago, when scientists realized that pumping groundwater from beneath the city, combined with the ground’s compaction from centuries of building, was causing the city to settle. Although groundwater pumping was stopped and with it apparently the subsidence, new research has shown that natural forces – tectonic plates – are continuing to cause the city to sink, while the compaction of the sediments beneath Venice also remains a factor. Climate change has seen floods occur more frequently along Venice’s canals with residents having to walk on wooden planks to stay above the flood waters in large parts of the city about four or five times a year. Barriers have been designed to protect the city from tides but designers, engineers and builders need to still take into account the rate of subsidence to make sure the barriers can do their job. Venice subsided about 120 millimetres in the 20th century due to natural processes and groundwater extraction, while in parallel there was a sea level rise of about 110 millimetres. Researchers calculate that the city and surrounding land could sink by about 80 millimetres (3.2 inches) relative to the sea in the next 20 years if the same rate continues. For those of you developing in Melbourne, I strongly recommend you read the Melbourne Water document referred to above. It is freely available from the Melbourne Water website, and may help to keep your head, and your building, above water. As an aside, the original 1.6-metre AHD flood level is a rounding up of a level of 1.52 metres AHD recorded in 1934, only 80 years ago! We also need to look into the colossal uncertainties associated with the behavior of the techtonic movements of the Earth's lithosphere plates that remain both unpredictable and incalculable. Perturbing stuff – bodes poorly for the future of Australian cities given that they're all situated on the coast.